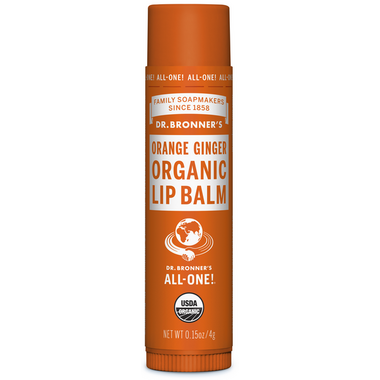 Dr. Bronner's Magic Organic Lip Balm is certified to National Organic Standards. Dr. Bronner's lip balms are based on pure organic oils and beeswax free of petrochemically modified ingredients. The organic avocado oil and beeswax provide excellent lip protection while the organic jojoba and hemp oils assist moisturization. Only the finest organic essential oils are used for fragrance. Great lip balm, very silky and feel smooth right after applying. Love it and will buy it again! Not a huge fan of this one. Love the peppermint one. This one just feels more waxy and I'm not loving the smell either. Personal preference: the peppermint one tingles your lips and makes your lips feel refreshed and doesn't smell or feel too waxy. 1. Did not help my lips at all. 2. Had a reaction to the "chemicals". 3. Made my lips peel. Only tried it because it was on sale. LOVE IT! Natural. Very pleasant mild ginger scent. Very moisturizing. Not waxy at all, like other lip balms. Amazing stuff. Will always use it!!! I like the fact it's an organic product with natural ingredients. I lips are somewhat dry, I didn't find this product to actually moisture my lips maybe I need to wait longer? It's nice - I can see how the scent/flavour might not be to some people's liking though. Personally I kind of like it, but I have a feeling I'd prefer mint or lime. Haven't tried the other types yet. Also the texture is nice, but the moisturizing effect is a bit funny somehow...starts out very wet but dries sort of fast, considering. I haven't given it much of a chance yet though, and it's still a lot better than many lip balms and chapsticks I've tried. Really like this lip balm especially since it is a natural product. It goes on smoothly and it moisturizes very well. Will buy again. The best lip balm ever. Mint is my favourite scent but this one smells nice too. Wonderful produce! Great lip balm. Nice smell, no taste, works well, and lasts long. I've tried many lip balms, Dr. Bronner's natural flavour is my favourite. Stays on and lasts. Great over lipstick. No odour or taste. The texture is slightly different from the other flavours. It's seems creamier to me. My husband likes it too (no scent). I love Dr. Bronners products! I use their castile soaps and also the lip balms. The orange ginger is my fave. It's so subtle and natural smelling. Not all fake and plasticky like other brands. It's very sheer, not waxy. Moisturizes well, but I feel like I must apply more than I would like. But still, this is the best I have found so far. But then again, I am a lip balm junkie. I keep trying them all! I do recommend this one. It is natural, which is my fave part! I'm not in love with the smell, but I love the fact that it's chemical free and goes on smooth and shiny. I love Dr. Bronner's and am so thankful these products exist. This is one of the nicest lip balms I ever bought. It is very silky and smooth compared to some of the ones I bought in the past. I like that it is all natural to. This is very smooth lip balm, it makes my lip feel moisturized. I like the ginger smell. While it does go on the lips smoothly and does its job once there, I find the scent too strong and perfumey even though I love the scent of ginger. I'll use it up, but I won't buy it again. I'm addicted to lip balms, and this is one of my favorites. Very smooth and silky with a bit of shine. I bought this for my husband and he said it's pretty good. He kissed me while wearing it and it left a silky soft residue on my lips. The scent is a bit medicinal smelling but it's tolerable. I love this lip balm. It has a really smooth application and my lips really feel moisturized, a relief for dry lips. I would definately recommend it. Love the look, very organic. All natural too! I usually buy Dr. Bronner's Naked lip balm, but it was sold out, so I decided to give this one a try. It has a lovely scent without being overpowering. Makes my lips nice and smooth and protects them from the cold weather. Will definitely buy this one again. If you like sweet ginger tea then you'll love this lipbalm. It's very comforting, and with the ginger its almost warming on the lips. Makes your lips very very soft. I LOVE this line of lip balm - this one is my favourite "flavour". It's so soft and glides on nicely... And it's gentle enough for my terribly sensitive skin! It's not often that I find a product that I'm not allergic or sensitive to. A lovely moisturizer. Not greasy, glides on smoothly and has a nice, mild scent. I can hardy wait for winter to see how it performs in the cold. I love the smell of ginger so I really liked this lip-balm. It has good staying power too. Also it's nice to pull this out of my handbag since it looks so unique and cult-ish.